With Georgia facing a complicated position in the context of world politics, the country has firmly chosen its way westward. Numerous reforms are being carried out to reach the ultimate goal of the EU and NATO integration. However, there is some skepticism among part of Georgia’s population regarding Georgia’s EU/NATO integration and benefits stemming from it. Over the past several years, the number of people with pro-Russian sentiments has increased. This trend has been showcased by a recent public opinion poll commissioned by the National Democratic Institute. A lack of general public knowledge on benefits and assistance coming from the EU, against the backdrop of increasing influence of the Russian “soft power”, is one of the main reasons behind these trends. It is therefore critical to begin endeavors to counter anti-EU propaganda and to educate Georgian citizens at large on the benefits of a close relationship with the West. EWMI ACCESS saw it useful to initiate an open and frank discussion on these issues with various stakeholders in Georgia’s regions in order to give the public concrete and objective information about EU-Georgia relations and the associated benefits, as well as to debunk myths and negative perceptions on Georgia’s EU and NATO integration disseminated mainly through anti-western media outlets. This initiative resonates with NATO Parliamentary Resolution 421 which calls for stronger support in countering anti-western influence and propaganda in partner nations. EWMI ACCESS conducted public information sessions and discussions in the key towns of 9 regions of Georgia – Batumi, Ozurgeti, Zigdidi, Kutaisi, Akhaltsikhe, Gori, Marneuli, Telavi, and Pankisi. The discussions broached questions such as: Is the EU market appealing to Georgia, more so than Russia’s? Can Georgian farmers and entrepreneurs actually comply with EU regulations and gain access to the EU market through the Deep and Comprehensive Free Trade Area (DCFTA)? Will Georgia lose other markets? Why do we need food safety standards? Does the EU assist Georgia’s agriculture and rural development, and how? When will the visa-free regime with the EU begin and what rules will apply to Georgian citizens? Is the Western world imposing policies and values that are incompatible with Georgia’s values and traditions? And, how is the EU helping Georgia to preserve its cultural identity, promote tolerance and protect the rights of minorities? Guest speakers included distinguished experts and representatives from the leading CSOs as well as the EU and NATO Information Center, the Office of the State Minister on European & Euro- Atlantic Integration, the Georgian Ministry of Foreign Affairs, and the Ministry of Agriculture. In total, over 600 people participated in the forums. Due to high interest and engagement of the audience, each session lasted up to 4 hours – the topics generating the most interest (mainly related to agriculture and visa free regime) were hotly debated after the presentations. The forums were also widely covered in regional TV, radio reports, and in print. Participants requested such meetings to be held more frequently in the villages to ensure that rural residents, who are directly affected by DCFTA and have no information about it, are aware of the existing opportunities. 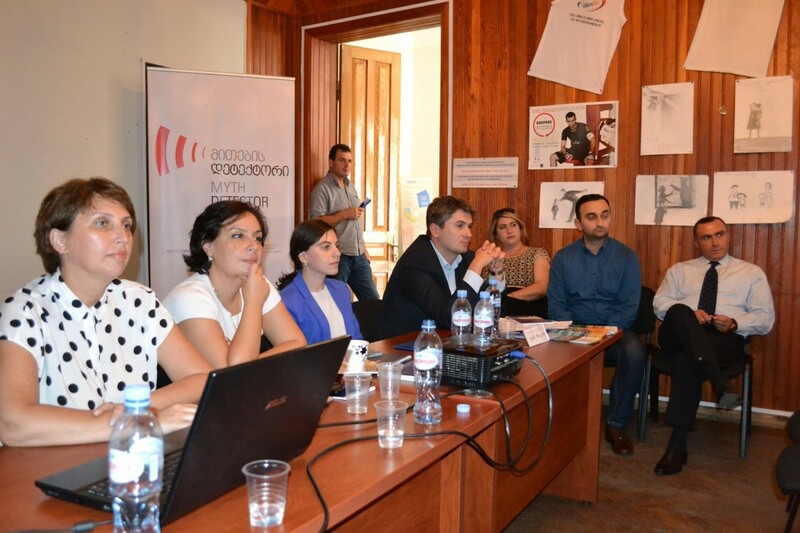 EWMI ACCESS thus recommends that the Georgian Government and the CSO community play a larger role in community education about Western integration, and more and larger events similar to these informational meetings be held consistently in all regions of Georgia. Such comprehensive discussions are the most open and democratic way to counter misinformation, misunderstanding, and foreign influence in Georgia’s ongoing policy dialogue.